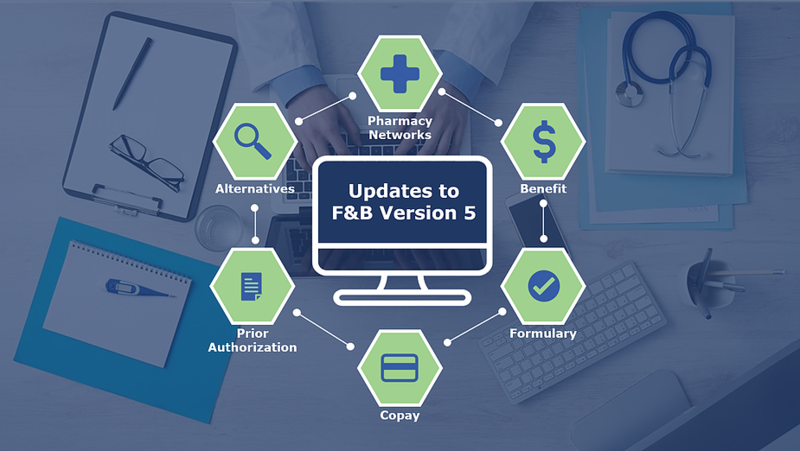 Formulary & Benefit Standard v5.x represents an upgrade over the current version of the standard. Significant new additions include (1) support to identify the pharmacy network, (2) improved copay and cost information, (3) clearer formulary statuses, and (4) redesigned alternatives information. Also, data normalization will significantly reduce file sizes and the amount of repetitive data. One new imperative for an updated version of Formulary & Benefit data is supporting indication-based formularies which are allowed in Medicare Part D formularies for the first time starting in January 2020. The inability to communicate indication-specific formulary information will be a limitation to meet Medicare Part D requirements for the existing F&B data. The industry has relied upon the current standard, Formulary & Benefit 3.0, since 2010. Feedback from payers, physicians, and other stakeholders has been valuable for identifying and justifying new updates to better support users. The results are smaller files which are easier to transmit and process and improved data for use by prescribers in EHRs. The expected mandate for the next version of F&B implementation is around 2022. While the changes are still some years away, the payer and EHR development required to implement and test upgrades will take time. Certifications by intermediaries who aggregate the data may also thoroughly test the creation of new formularies by each payer and the use of the data in each EHR. This testing will ensure that all of the optional data fields created by each payer are properly used in more than 500 EHRs in the market. This is a sentinel event for formulary information in EHRs that will set the stage for years to come. With Real-Time Pharmacy Benefit transactions coming online over the next few years, some might argue that formulary data is obsolete. However, those working on changes to the NCPDP Formulary & Benefit Standard consider F&B data important for informing the prescriber’s first choice when selecting a drug using formulary information in the EHR. Perhaps the biggest change in the F&B data provided is the inclusion of pharmacy networks information. For the first time, users of F&B data in the EHR will be able to identify out-of-network pharmacies specific to a patient’s plan. Also supported in the new version is information on specialty pharmacies included in the payer network. Pharmacy network information has been a long-requested addition to F&B data. This information helps prescribers avoid selecting an out-of-network pharmacy which may result in expensive, abandoned prescriptions or confusing requests to resend or transfer prescriptions to in-network pharmacies or designated specialty pharmacies. While improving the prescriber’s ability to select the right pharmacy, pharmacy network information ultimately benefits patients who may gain access to more affordable choices. Another improvement is redesigned drug alternatives and step therapy information. The alternatives data structure has been updated to make it reusable from one formulary to another, creating more use of each alternatives list and reducing the overall volume of data. The new format also includes data on conditional step medication to improve step therapy indicators and allow communication of more complex requirements. Expanded use of copay information includes the ability to display drug cost ranges (including a percentage of the cost). Medicare Part D support and approximate drug cost information will assist prescribers in understanding the patient copay and the total cost of the drug, which may improve prescribers’ ability to select drugs patients can afford. Finally, structural changes designed to improve the use of the data and reduce file sizes are planned. Other updates include better support for Electronic Prior Authorization (ePA) and expanded Medicare Part D capabilities like the previously mentioned indication-based formularies. At BenMedica we have already begun discussions with each of our clients to determine how to best capitalize on new F&B capabilities. Formulary creators must redesign how they extract data from existing systems to create the new format and meet the implementation deadline. This planning phase also creates a window to add requirements that include more patient-specific information in the new format. This includes the ability to create more group-specific formularies without increasing file sizes greater than today’s data payload. EHR redesign will feature (1) display of the new pharmacy network data and (2) step-therapy information. Revised layouts will allow payers to create more formulary data with reduced sizes and less repetitive data. This update to F&B data within EHRs represents a significant improvement to both the prescriber’s ability to select appropriate drugs and the patient’s access to more affordable medication options. Coupled with BenMedica’s efforts in leveraging formulary data to provide clinically equivalent alternatives sortable by cost, prescribers will have the information they need to select the right drug at the time of prescribing. Improving the data will prepare prescribers to make the best choice with the most complete information for the prescription prior to any further feedback from the payer or pharmacy after the prescription has been written.